There have been numerous upsets and surprises at this year’s FIFA World Cup. First one to serve it cold was Iceland, which managed to end its debut game with two-time champions Argentina in a draw. By the end of the first round, South Korea delighted even the most casual observers of the game when it defeated defending champion Germany, which pundits predicted the most likely to win the World Cup yet again. 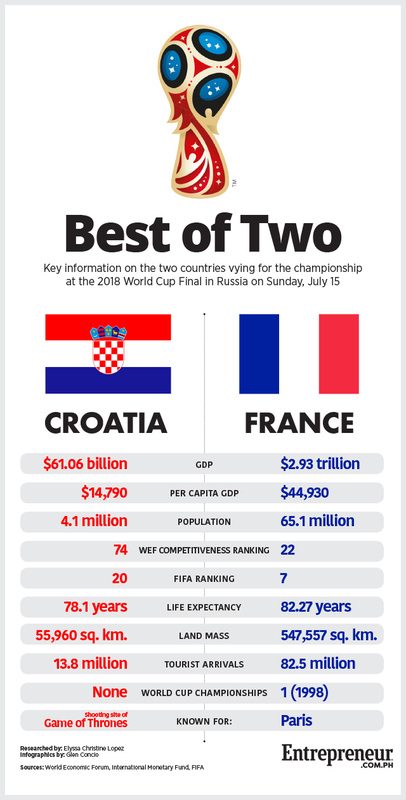 But the biggest bombshell so far is how Croatia emerged as a finalist against FIFA veteran and former titleholder France for the championship. This was after the tiny Balkan nation defeated England, a similar crowd favorite, in the semi-finals. To say this year’s World Cup finals is a game of David versus Goliath is an understatement. France has participated in the World Cup 14 times and made it to the finals twice. The year 1998, when France won the championship, was also the first time Croatia ever participated in the World Cup. To be fair, Croatia’s debut performance in the tournament was also historic after it placed third that year. Still, it never made it that far since. But it’s off the pitch that the disparity between the two European countries is most apparent. France is home to 66.9 million people, around 16 times larger than Croatia’s total population of 4.1 million. Indeed, Paris, the French capital, has more people than the whole of Croatia with 12.1 million inhabitants. In land area, Croatia is just a tenth the size of the whole of France. Economically, the discrepancy is larger still. At $2.47 trillion, France’s gross domestic product (GDP) is about 48 times that of Croatia’s $51.34 billion. French citizens, with an average per capita GDP of $42,778, are also almost twice as rich than Croatians, with $25,264. Will all these matter when the contenders face each other on Moscow’s Luzhniki Stadium this Sunday? Watch the game to find out. The finals will be broadcast on Sunday on ABS-CBN Sports and Action, a free TV channel, as well as on Fox Sports, a subscription cable channel.